2019 is officially here! I've decided not to spend another year announcing my goals because doing is better than talking but, there is one overarching mantra that I believe we could all benefit from in this new year. WORRY ABOUT YOURSELF! It’s simple. Water your own lawn and watch it flourish. The concept first occurred to me earlier last year when I witnessed a few close friends making what I viewed as unwise choices. I’d rack my brain trying to figure out why they wouldn’t take an easier route. I’d spend hours having damn near lectures or finding resources to remedy their situation. Then the revelation came that I was only a few inches away from their current situation. Here I was talking about what they had going on, and yet I wasn’t financially where I needed/wanted to be, not all of my business moves were spot on, and some of my love life choices didn’t add up. I genuinely want what's best for those around me and felt responsible for their growth. I wasn't as opened minded as I thought in the understanding that everyone wants different things out of life. Playing “mother” and being overly concerned with my friend’s lives had derailed my own. I had become so busy trying to steer people in my life in a positive direction that I had lost focus on my personal goals. Not only was I being preachy, but I was also simultaneously following along in the very situations I was arguing against as if to say "what you're doing is stupid, but I'm not going to let you do it alone." Partly I did it because it’s my love language. I love to help those I care about, and I feel a sense of responsibility for them, but I also have identified that there was some self-righteousness underneath. There was the idea that I was the resourceful one and my way was superior. Social media also plays into the idea that our way is the correct and only way. You’re likely to encounter several posts a day asking you for your opinion on someone else’s life like “should she accept a $25 ring" or "how old should you be when you buy your first house." If you think about it's crazy about how much we debate over what other's do with their lives. We don't realize we are wasting away our own. What I've come to learn is there is nothing wrong with correcting those around you in love or having your own opinions and preferences, but it becomes toxic when your life is comprised of nothing more than your judgments against others. Even in the Bible, it speaks of getting yourself together before putting all your focus on someone else's downfalls. Instead of going on rants about best practices I’ve learned just to do them. I pray for that everyone around me succeeds in all areas of their life, but I had to realize it’s not my job to hand hold them there. It's my job to speak my peace, help when and if I can, but also allow others to do what they choose to do even if I disagree. In focusing on myself, I’ve become more resourceful, more accomplished and less stressed. To be honest, being a living testament has helped me reach more people than just being someone who is all talk. I also had to learn it’s not my job to press my living standards on someone else. It’s okay if I want to live lavish while the next person simple life. Neither of us is wrong. Long as we are both living healthy lives and are happy there’s no need for a debate. There's going to be some things that people will do that you won't, and that's okay. It could just mean that, that thing isn't your cup of crown — nothing more or less. If it's not causing you or anyone else harm let it go. And in some cases even if it does cause that person harm, it's their life, and it's only so much you can do. 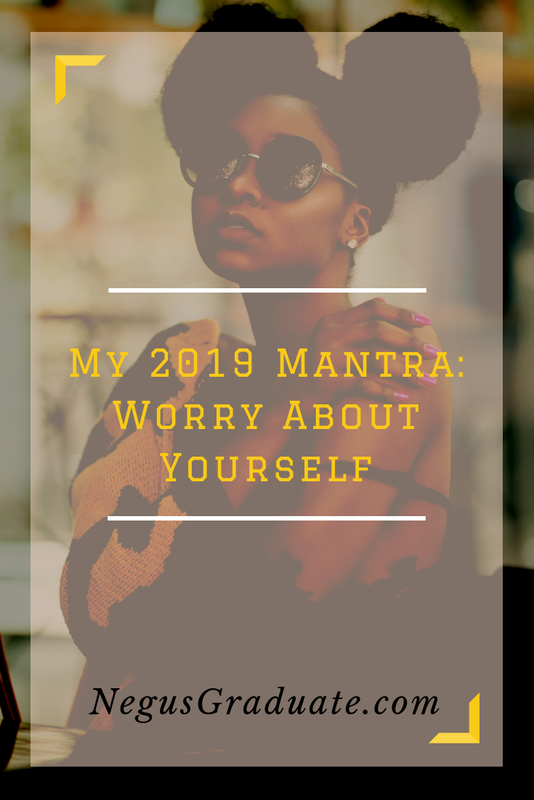 Now do yourself a favor this year and worry about yourself. Walk in love. Focus on YOUR goals and the things that make YOU happy. It's okay if not everyone gets it. Do it for you and unapologetically so. Is Dating While Broke A Good Idea?